The Who: I’m Tom. I’ve lived, travelled and worked in Vietnam since 2005, and I love it here. I was lucky enough to travel abroad from an early age – my first visit to Vietnam was in 1999, age 17 – but now, whenever I have the opportunity to make a trip somewhere, I rarely look beyond Vietnam’s borders. For me, everything that I look for in a travel destination – landscape, food, people, history, culture, adventure, romance – I can find here. The When & the Why: I created Vietnam Coracle in 2012, partly as a way to share and express the experiences I’ve had in this country, and partly because I was frustrated by meeting people who had come to Vietnam – either to live or to travel – and left disappointed. This site is my way of making sure that, for those with a sense of adventure, Vietnam doesn’t pass you by. The What & the How: Vietnam Coracle is a free online resource for independent travellers. My articles are extensive guides to food, drink, destinations, motorbike trips, and accommodation throughout the country. All my guides are 100% independent: written, researched, illustrated, and experienced by me. If it’s on Vietnam Coracle then I’ve been there and done it. My guides include detailed maps, directions, addresses, relevant web links, hotel and restaurant reviews; all the information you need to experience the places I write about for yourselves. It’s Personal: Vietnam Coracle is a deeply personal view of Vietnam: I write about all the things that I love. I tend to prefer off-the-beaten-track destinations and activities to well-trodden or touristy ones. This is partly because the latter are well-covered by other resources, and partly because, in my experience, the further you get from popular destinations in Vietnam, the better your experience will be. If and when I write about a popular place, I usually focus on a specific aspect of it which appeals to me. An example of this is the Lantern Festival in Hoi An. Ratings & Reviews: I include and review all standards of accommodation, dining, and travel – budget, mid-range and luxury are all covered on this site. However, I always judge a place based on my own expectations of value for money. If a $200 a night resort offers good but not excellent accommodation and service, then I will rate the $10 a night, friendly, family-run guesthouse next door, more highly. Likewise, when it comes to eating in Vietnam, a good meal is about more than just the quality of the food: a confluence of physical surroundings, ambience and food is what constitutes a good meal for me. Since street food is so good and so popular in Vietnam, the kind of place that meets the above criteria is not the indoor, quiet, sterile, ‘restaurant environment’, but the outdoor, busy, messy, noisy and delicious place on the sidewalk. Keeping it Current: Unlike printed guides, Vietnam Coracle is ‘live’, which means it can be updated easily and immediately. All travel information in my posts is accurate at the time of writing, but such is the pace of development in Vietnam, that some details are bound to have changed by the time you read them. Always check the top of the page for the date of my latest extensive update (see the top of this page, for example). I encourage readers to let me know of any new developments or changes they encounter while travelling, so I can keep my articles as current as possible. Your input is a great help to me and other travellers. Readers can either comment at the bottom of my posts or email me with information (click here for contact details). *Note: If you want to stay informed each time I post a new article or make a thorough update to an existing one, you can subscribe to my newsletter and/or join one of my social media pages. My Destinations Category covers some of my favourite places to visit throughout Vietnam: beaches, mountains, cultural and historical sites, and much more. Some destinations in Vietnam, such as Halong Bay and Hoi An, are very much on the ‘beaten track’. But, despite their popularity, these places are still relatively quiet and charming when compared to similar spots in Thailand and Malaysia. However, away from the established tourist trail, there are many emerging destinations that remain wonderfully undeveloped. These areas – such as the Con Dao Islands – should be visited as soon as possible, before those annoying people start saying, “You should have seen what this place was like five years ago!” Remote, mountainous regions, especially in the north, require a bit more effort to get to, but you’ll be rewarded with incredible scenery: Ban Gioc Waterfall (pictured below) is one such place. See the Destinations category archive for more ideas. Food should be a highlight of any visit to Vietnam. Yet many travellers return home underwhelmed by their culinary experience of the country. This is partly due to Vietnamese restaurants that cater to foreign tourists. These places are more likely to offer the ‘idea’ of Vietnamese food than the real thing. My food and drink guides will help you bypass these ‘phony’ places and get straight to the ‘real stuff’. 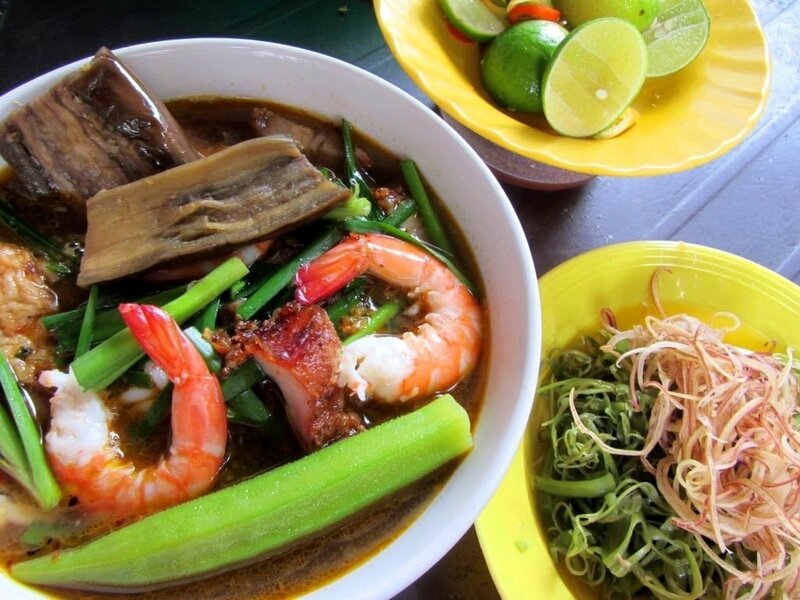 Some dishes – such as bún mắm – can come as a shock to western palates, but others – such as cơm tấm– are much easier to get to grips with. It took me more than a year before I became familiar with the Vietnamese flavour spectrum. But, once I learned to trust the Vietnamese palate, a whole new and delicious world opened up to me. A good thing to remember is that it’s often the most informal and run-down looking establishments that serve the best food; follow the crowds, not the décor! And don’t forget the drinks: Vietnam is a nation of cafes and informal bars. The urban independent cafe scene is particularly exciting. See the Food & Drink category archive for more suggestions. Few things compare to the feeling of freedom and excitement you get when starting out early in the morning on the open road. The motorbike is the most popular mode of transport in Vietnam, and there’s no better way to see the country. Over the years, my motorbike, Stavros, has taken me to all of Vietnam’s 63 provinces. Having your own two wheels gives you unparalleled access to Vietnam’s landscapes and cities. You won’t be restricted by bus, plane or train routes: the whole country is open to adventure. 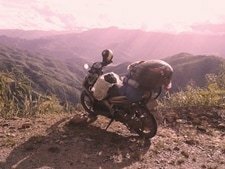 My motorbike guides outline great rides throughout the country: from the Ho Chi Minh Road to the Extreme North Loop, from gentle back-road jaunts to epic south to north adventures. All my guides include detailed route maps, and information about things to see and places to stay and eat along the way. With my motorbike guides you can do it all independently. Don’t be put off by the chaotic traffic in Hanoi and Saigon: once you’re out of these cities the traffic is much lighter. Nevertheless, some roads can be dangerous, but, with common sense and careful driving, you’ll be fine. See the Motorbike Guides category archive for exciting routes all over the country. One of the things that has always excited me about travelling, is the prospect of stumbling upon and staying in a great-value accommodation. Whether it’s a dorm bed for a couple of dollars in a city centre, an immaculately clean family-run guesthouse in an off-the-beaten-track location, a mid-range hotel in a fabulous position, or a 5 star resort with exquisite attention to detail; I love them all and I review them all on Vietnam Coracle. As with the rest of my content, my accommodation reviews are detailed, personal and 100% independent – I never write a favourable review in return for payment. From camping on the coast to luxurious French Villas in the highlands, from homestays in the mountains to tropical island resorts, my reviews cover the whole country and all price ranges. See the Hotel Reviews category archive for more ideas of places to stay. *Note: If you’d like to support Vietnam Coracle and the work I do, please consider booking your hotels through my site via the Agoda search boxes (like the one below) or links like this one. If you make a booking, I receive a small commission (at no extra cost to you), which gets ploughed straight back into this website and goes a long way to keeping Vietnam Coracle up and running. Thank you! Vietnam is an exciting place to be at this point in time. The country is undergoing huge transformations in almost all aspects of its society and culture: from economics to eating habits, from religion to relationships, from family to foreign policy. For the traveller, tourism is in the perfect phase of transition: infrastructure is developed enough to allow access to practically all regions of the country, but undeveloped enough to make off-the-beaten-track experiences a daily occurrence, should you seek them out. But, with the current pace of change, some things – unspoiled islands, historic buildings, local eating houses – are bound to disappear forever. Don’t wait, visit now! New dawn: Vietnam is experiencing huge changes in all aspects of its society & culture – exciting times! Vietnam Coracle is, and always will be, free and independent. As the site has grown, Vietnam Coracle has became a full-time occupation for me. Therefore, I must monetize it in some way. Rather than charging for access to my content, I have chosen to make personally selected, content-based advertising available on my pages. These ads are aimed at complementing my content, rather than distracting from it. I advertise products, companies and services that I think will be of use to my readers, and, preferably, ones that I have personal experience of. You’ll see my ads in the right sidebar and bottom of all my posts, under the title ‘Selected Resources for Travellers & Expats’. For more information about advertising on Vietnam Coracle and how it works, take a look at my Media Kit. Hi Tom, I came across your site researching info about Con Dao as I leave for Con Son tomorrow… just wanted to say that you have great content! Shared some links and wait to read a lot more as soon as possible. Thanks for helping out your fellow travellers from around the globe. Thank you, I appreciate it. I hope you enjoy the islands. Thank you for your detailed and very helpful information above. Could you recommend a good motorcycle tour company which do excursions on a motorcycle around Saigon and its surrounding areas for a 2 – 3 days all inclusive. unfortunately I have booked a flight in haste to Saigon then found out about the Ha Jan Loop in Hanoi. its looking like to much hassle to change flights to Hanoi so im trying to find the same tour arround Saigon. Take a look at the motorbike companies I recommend on this page – they should be able to arrange something for you. Also, note that Ha Giang is a long way from Hanoi. I don’t have any specific recommendations for bike rental shops in Sapa, but it shouldn’t be too difficult to find one there. However, another option is to contact the Hanoi office of any of the trusted bike rental companies that I recommend on this page, and then asking for their assistance in arranging to send your bike on the train from Hanoi to Lao Cai (Sapa). That should work. Great detailed guide. It’s a huge help! My girlfriend and I are visiting Vietnam in a week for three weeks and we’re thinking about flying from HCM to Tuy Hoa shortly after arrival to relax for a few days on the some of the stunning beaches in the area between Tuy Hoa and Quy Nhon (Bai Xep, Bãi biển Gành Đá Đĩa, Bãi biển Ôm, Ky Co beach); our main wonder is: how easy will it be to get from one beach to the other without driving a motorcycle? My girlfriend has never driven one and we’ve read that Vietnamese roads can be quite dangerous especially for inexperienced drivers, and driving without an internationally recognised license is illegal. Would you recommend hiring a taxi whenever needed (are they expensive)? Or is it also possible to hire a motorcycle with driver included in Tuy Hoa that would give us a lift whenever and wherever needed? Also is the weather summer like during this period of the year (end of February) in that area? The weather should be OK by the time you arrive – often conditions north of Nha Trang between November and February can be disturbed, but as you’ll be going in late Feb, it will probably be fine. It’s not that easy to get from beach to beach in that area if you don’t have your own wheels. You could hire a car and driver – your accommodation in Tuy Hoa should be able to arrange that for you – but it will probably cost $90 a day. Taxis are OK for some of the beaches, but that would also be expensive. Tom, thank you so much for the advice. Everything you write is so helpful and gets me so excited about discovering Vietnam. I can’t wait to make great use of your amazing guides! Tom, I definitely agree with what previous posters have said about the helpfulness of your website. It has been a great resource as I attempt to put together my itinerary for Northern Vietnam. What roads are best and quickest between Ba Be park and Meo Vac? Do you recommend traveling via Da Vi and Bao Lam, bypassing Bao Lac? Or better to go via Tinh Tuc and Bao Lac? I’ll be in a hired car with a local driver and guide, if that makes a difference. (I’d love to cycle but no longer trust my skills and my wife won’t ride on the back anyway). Can you also let me know how many hours I should expect between Ba Be and Meo Vac? For the quickest, easiest route between Ba Be Lake and Meo Vac I would go up to Tinh Tuc then across to Bao Lac and up to Meo Vac on QL4C. It’s probably a 4-5 hour drive, not including stops. It’s very scenic, too. I’m a solo female traveler and looking to rent a bike and ride from Saigon to Hanoi starting in late November and will have about 4 – 5 weeks to take my time on the ride. I know the weather can be a bit unpredictable but do you think the roads in the North and middle of Vietnam will be okay during this time of year? Also, do you recommend I start from Hanoi or Saigon during this time of year? The weather in central Vietnam – anywhere between Nha Trang and Hanoi – can be pretty bad at that time of year, but of course you never really know.If there happened to by a tropical storm, then some of the more mountainous roads could get flooded or suffer from landslides. Just keep an eye on the weather forecast for heavy rain or storms – try Windy app, it’s very good. Thank you for a wonderful website with a lot of valuable “inside” information. I write to you in some sort of confusion, there is so much information about Vietnam everywhere but at the same time, I’m cannot seem to find out what is the best option for us. Me and my mother are planning a trip to Vietnam over Christmas and New Years. She has traveled throughout her life but like me, never visited Vietnam, despite talking about it for several years. We are going to spend a few days in HCMC (where we are definitely going to use your swimming pool guide, my mom is a former elite swimmer) and then I was thinking for us to head for Phu Couq to swim and relax. Our first option was Danang but my friend tells me it’s not the right period in terms of weather, we are from Sweden so we want to catch all the sun we can. As I read about the beaches of Phu Qouq, there are a lot of rubbish in some places and the water is not clear. I’m afraid we will choose a resort where we are stuck in a place which is not that clean and where we won’t enjoy the swim. I hope it’s not too much to ask, but perhaps you have a suggestion on where on the island we should look for a resort or which places to avoid? My mother has just been diagnosed alzheimer’s, and hiring a moped is unfortunately not an option. We want to avoid those big resorts and touristic places. I want to give her the best memorable travel experience she can get, now while she can, and while Vietnam is hopefully relatively unexploited. Yes, you’re right about the weather: Danang can be wet at that time of year, but Phu Quoc should be clear and dry and the water very calm. Phu Quoc Island is increasingly developed but there are beaches that are still quiet and clean. Take a look at my Guide to Phu Quoc’s Beaches to get an idea of where the different beaches are and their different characters – the guide also includes accommodation options. As an example, Ganh Dau, Ong Lanh, and Cua Can are all quieter, clean beaches with good resorts. It’s such a great job of you for sharing your all experience about many trips in my country on this awesome site. I have just watch a bit at your site at Allezboo Resort that you showed me at the restaurant. I am completely impressed by what you are doing. I do love travelling. I hope you can share more your experience. Thank you! Hope to see you at Allezboo! 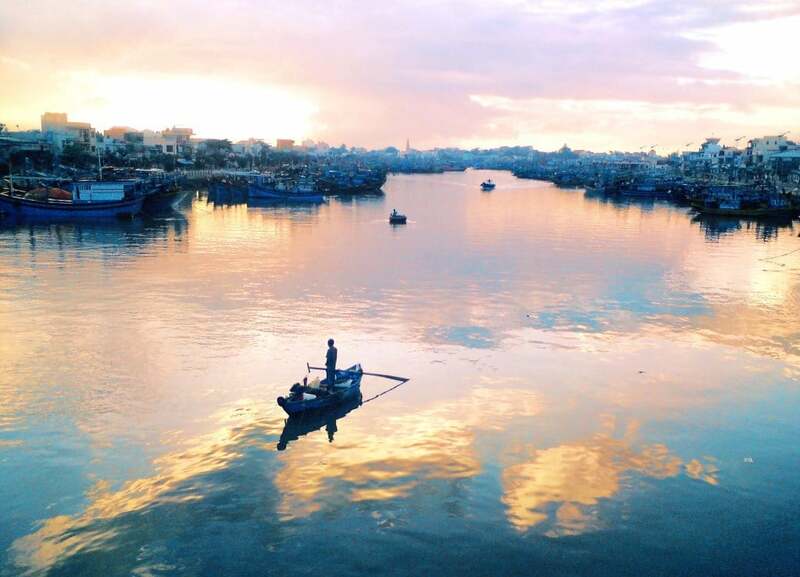 Great work on this site – I’m in awe of your content and am beyond excited to visit Vietnam! I had some questions on what you’d recommend for my family. We’re headed to Vietnam for the last two weeks in November. We are two adults and a 10 year old boy. We were hoping to do a motorbike trip from Saigon to Hanoi, but are starting to realize it might be a bit too much for our time frame. We are looking to take a slow pace and keep the stress to a minimum. We’ve also decided it may be best to skip the central part of the country due to the likelihood of a lot of soggy weather there. That said, we’re looking at your northeast motorbike loop or exploring the National Highway QL32/Provincial Road DT128/National Highway 4D area in the northwest. After one of these journeys, we’re considering flying or taking a train south to Ho Chi Minh. Once down there, we will likely rent bikes again and do another loop ENE of the city – beaches/central highlandsDalat. My questions are many, but I will try to keep them to a minimum here. Is this feasible within our timeline of 14 days? My husband and I are at odds on the decision whether to take a train to Ho Chi Minh or fly – would you recommend one over the other? Lastly, any issues you see with taking our young son on the motorbikes? He would ride on his Dad’s bike. Thanks so much for sharing this wealth of information! Yes, it’s wise to miss the central provinces which are at their wettest at that time of year. But the northern mountains can also be surprisingly chilly (and wet) at that time, too. 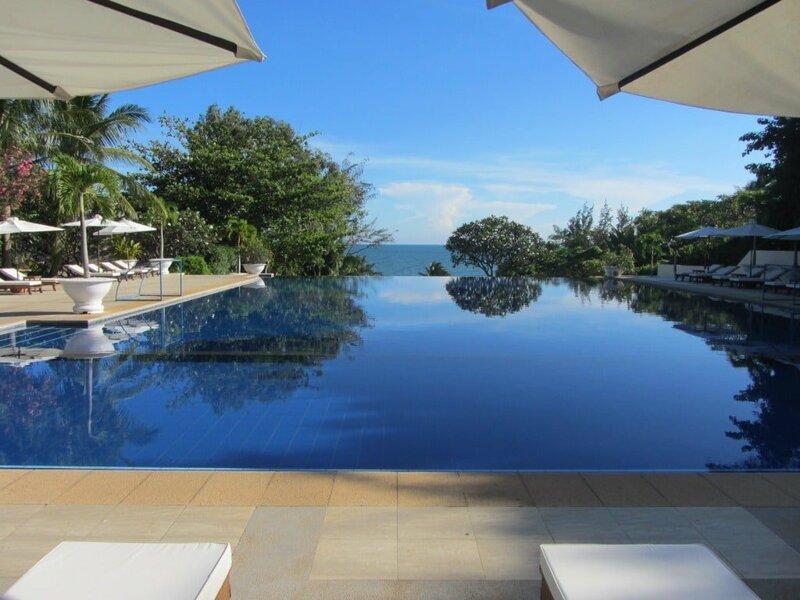 The best weather in November should be anywhere south of Nha Trang – but you never really know, of course. I’m not sure about taking your 10-year-old on the back in Vietnam. Once you’re out of the city the roads are generally quiet, but the driving is still very dangerous, and road conditions can throw up unexpected challenges. Ultimately it’s up to how you feel – if you’re experienced riders then I’m sure you’ll feel more confident about it. If you decide to do it, then a couple of shorter trips would be better than one big one. For example, if you rent bikes in Sapa and then take Road QL4D down the Tram Ton (O Quy Ho) pass and join Road QL32 to Mu Cang Chai and back to Sapa again, that’s a good ride for 2-3 days. Then in the south you could rent bikes in Mui Ne (Phan Thiet) or Dalat and do a loop or two there – there are lots to choose from, but for example, the Binh Thuan Back-Roads Loop. Oh, and yes I think you should fly between Hanoi and Saigon, given your time frame. I am looking for the deep swimming pool in HCHM. I know that somewhere in District 1 there is a pool with 5 meters depth. May be you know this one? I would appreciate any information about deep swimming pools in Saigon. Check out my list of public pools in Saigon here. Most of the Olympic-sized pools in that list have depths of up to 2-4 metres. But if you’re look for really deep pools for high diving, I’m not sure about that – perhaps Phu Tho pool. Nice information about the waterfalls nearby Dalat. We want to hire a scooter for 1 day. Which waterfalls do you advise to go to? We stay in a hotel in Dalat. Which waterfalls are not far to walk too? The only waterfall that’s walking distance is Cam Ly, but it’s not really worth going there. The next nearest waterfall is Datanla, which is OK.
With a scooter I would recommend visiting Elephant waterfall and then you can do a loop to visit Pren Waterfall and Datanla on the way back to Dalat. The most impressive waterfall is Bao Dai falls, but you probably won’t have time to do that in one day. Hey Tom, I’m going to Vietnam for the first time, planning on buying a motorbike in Saigon (I intend to live in Vietnam for 6-8 months) and driving to Hanoi, on a combination of your routes for Uncle Ho’s Road and the Beach Bum routes. Wondering if you have a more comprehensive guide to the Beach Bum route, like the one for Uncle Ho’s road? Thanks for all of the information, this site is fantastic! Click the yellow motorbike icons on the Beach Bum map: this will open a dialogue box with a photo and a link – if you click the link it will take you to my guide for that specific part of the Beach Bum route. Also, take a look at my Coast Road guide, and click on the green motorbike icons on that map to go to my guides to those specific parts of the route. Great info and referrals. We are two “older” females 56/63 who have traveled quite extensively over a period of time. Our greatest achievements, and best holidays were when we could avoid other tourists, touristy spots, large hotels, bus tours and resorts. Selfishly, we want to be the only “tourists” – get to know the people, their way of living, eating etc. We want to visit Vietnam for approx 20 days in March/April 2019. We don’t feel like scaring other people with our motorbike riding skills – and we will not take your advise on those routes. 3. Would like to stay at least 5 days in one spot (beach). Should we do South/Central Vietnam OR Central/ North Vietnam as first time travelers? Bookings for April 2019 not open yet – and we will use Agoda for accommodation as suggested. In the meantime we can research and get excited. March/April is usually best in the south/central region. For quiet, beautiful and untouristed beaches I suggest taking a look at Cam Lap Promontory for a few nights (you can take an overnight train there from Saigon to Cam Ranh or Nha Trang). In my opinion, Con Dao Islands offers some of the best seascapes in Vietnam: it’s a fabulous place to be for many reason, yet for hardly anybody goes there. Cat Tien has some interesting accommodation and it’s growing all the time. You could take a look at staying in Kon Tum as an alternative destination in the central highlands. Ma Maison is a good accommodation for not being in the middle of all the normal Saigon tourist sites. Bear in mind that, in general, it’s much harder to get off the beaten track without a motorbike. So it might be a good idea to rent a bike once you are at your destination – for example, on the Con Dao Islands and Cam Lap Promontory where there’s very little traffic. Your site is great but I’ve been looking for some pratical informations that you don’t mention anywhere, such as what kind of driving license do we, as foreigners, need to be able to drive a bike in Vietnam ? Furthermore, can you please advise on insurance we should apply before driving there ? I’m not quite sure that insurance we contribute to in Europe is covering you in case of accidents or worse. I would recommend contacting the motorbike rental companies recommended in the right sidebar and bottom of all the pages on my site in order to ask their advice and opinions about both driving licenses and insurance coverage in Vietnam. It’s not always clear cut and the rules, regulations and practices seem to change regularly. I have a local driving license, but I live here, have work permit, local insurance, business visa etc, so it will be different for you. Try contacting Tigit Motorbikes, Flamingo Travel, Rent a Bike Vietnam, and Dragon Bikes – I’m sure they can give you good advice. You can mention Vietnam Coracle if you like, they know me. Congratulations on such an inspirational and informative website. Myself and my wife are in our early to mid 40s, are children are raised and we have decided to give up our jobs and our life here in Ireland to travel for an unknown amount of time. We leave Ireland at the end of January 2018 and are going to work in a Ski Resort in France until the end of April. Like I said your website has been such an inspiration we really want to travel in Vietnam extensively using the bikes, camping and accommodation recommended here. We are very flexible regarding the length of our stay (I was thinking about 2-3 months) and can travel any stage between the end of April to the end of November. I had always thought of travelling south to north however with our dates i am wondering if north to south may be better ? Great to hear that you are planning to spend a long time in Vietnam on a road trip – with that much time and with a motorbike you’re bound to have a great time. Because of your flexible dates it doesn’t really matter if you go south-north or north-south: the worse weather in the north (and central) regions is usually between November and March, so as long as you avoid that you should be fine. Personally my favourite times for a south-north road trip are April/May and September/October. For more about weather in Vietnam take a look at this guide. I had read the guide and your comments confirm that the best time for us to go would be September – October (We may add a week each side of them dates). We’re planning to visit Vietnam in a couple of weeks. Hanoi, Phu Quoc and Ho Chi Min. I came across your guide and I’m blown away by how comprehensive it is. Its easily the best resource I’ve come across on the tinterweb. So I thought I’d just say thanks. Thank you. It’s great to hear you’re enjoying my site. I hope you have a good time in Vietnam. Your web site is awesome. Make my trip much easier. I’m driving Hanoi to Ho chi mihn in this December. Thanks, Kalle. I hope you had a great road trip! May I use the photo of The Cafe Apartment ? The photo will be credited to you. Yes, that’s OK as long as you credit the photo as by Vietnam Coracle. Yes, you can use some of my photos as long as you credit Vietnam Coracle for each of my images that you use. If you agree to this then please let me know which of my photos you want to use, and then I will send you the image files. I absolutely love your travel blog. I’ve already spent countless hours over the months thoroughly reading through everything, and still go back for more. Thank you!! You are a huge inspiration and play a big part in preparation of our upcoming trip next month (February 2017). We are buying our motorbikes in HCMC (via Tigit Motorbikes) who come highly recommended, and we will be travelling Saigon to Hanoi over 4 or so weeks. I am especially interested in your routes “Classic” and “The Big One”, both of which sound amazing and cover everywhere we’d like to go, and some. Lagi – Mui Ne – Phan Rang – Cam Ranh – Dalat – Nha Trang – Quy Nhon – Kontum – Hoi An – Hue – Khe Sanh (via A Luoi) – Phong Nha – Hanoi, where we return our bikes. We then hope to visit Halong Bay for 1 night/2 days. Please may I ask your advice and see which route you believe would work best for us, in terms of time and perhaps what areas you feel are worth staying overnight, or for longer. Thanks, it’s great to hear you’ve found my site helpful. Is the Hai Van Pass (Golden Loop) between Hoi An and Hue? We hope to visit Halong Bay on a 1 or 2 night cruise/tour. Can you recommend any companies to go through? Yes, that’s right, the Hai Van Pass links Hoi An and Hue. There are a great many cruise/tour operators for Halong Bay so it’s difficult to recommend one above another. However, I would advise paying a little extra money for a much better experience: many of the dirt-cheap tours get very bad reviews from travellers, so it’s worth paying a bit more to make sure you get a good tour. I watched the Top Gear Vietnam Special last night, absolutely fantasic! 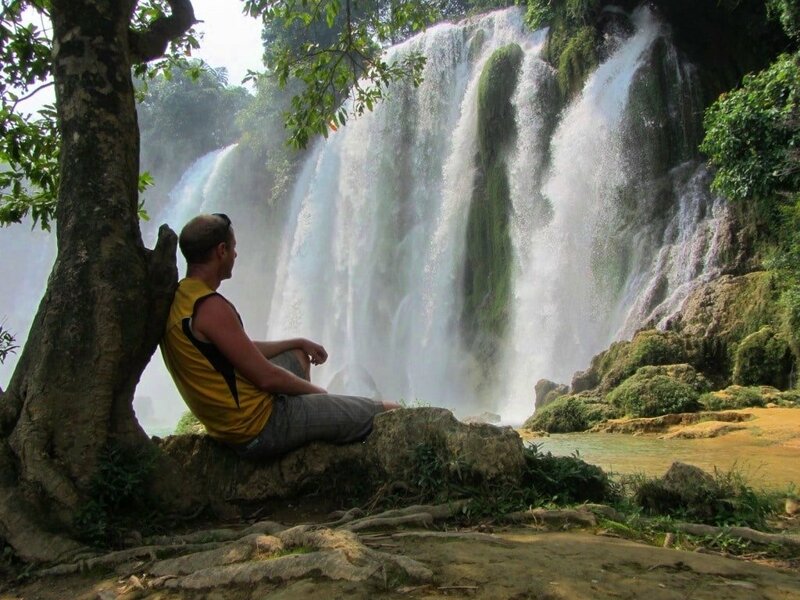 Can you recommend any areas worth going/staying between Phong Nha and Hanoi? It looks like quite a long drive. Yes, it is a long way. Take a look at sections 6, 7, and 8 of my Ho Chi Minh Road Guide for details about where to stay between Phong Nha and Hanoi. Long due Thank You note. I made a successful road trip from Saigon to Dalat and back to Saigon last year. You were the inspiration behind this trip. Visited all the places mentioned in your articles like Windmill cafe in Dalat, the small hidden coffee place with view of Ke ga light house and many more. Thanks a ton for your efforts and adventure stories. Its always fun to read your articles and the minute direction specifications are superb. Keep up the good work. Keep Inspiring! !Looking forward to my North Vietnam trip in some time. Thanks so much, it’s wonderful to hear that you had such a good road trip and that my guides helped you find some special places along the way. I hope the memory of your trip will keep you going until you get the chance to come back to Vietnam and do it all again – there are lots of great landscapes, foods, and places to explore and people to meet in the north of Vietnam too! I have just found your website through the latest edition (Aug 2016) of the Lonely Planet. You are at the top of their list of ‘useful websites’, even above their own, which I found interesting. I would like to congratulate you on a great website. I opened it at around 6pm and now it’s after 12am, so I suppose that tells you how much I am enjoying exploring it. I am coming to Vietnam at the end of November on my way to visit my daughter in London for Christmas. I’ll email you again once I have decided on the places I would like to visit and hopefully get your advice on whether it’s doable. Great to hear you like my site. Sure, email me when you have an idea of what you want to do and see in Vietnam. Great site! I just went to your best Pho in Saigon recommendation and it was excellent! I lived in Hanoi for half a year in 2006 and just arrived back yesterday. I’m in shock, the city (at least what I saw yesterday riding around Hoan Kiem Lake, out to the Lotte Center, and near where I lived off Pham Ngoc Thach ) has changed so much. It’s mind blowing. I’m hoping to move here (to Vietnam, most likely Saigon) next year at some point. Just a question, any recommendations for Vietnamese learning materials you’ve found particularly useful over time? I’d like to have a basic grasp for when I move here. Thanks and thank you for all the excellent info on the site! Yes, the city has changed a lot since 2006! I can imagine how strange it must be to visit again after so many years. It’s a great idea to learn some Vietnamese for your next stint at living here. Have you ever heard of Learn Vietnamese with Annie? I haven’t used it personally, but many of my friends have and they give it the thumbs up. Another one to try is the I Love Vietnamese Project. These should be good places to start. another useful site is everydayviet.com (also on youtube). Donna, a pretty young woman, introduces twenty-odd, very useful free lessons online. She speaks with a clear Saigonese accent. I am going for traveling solo to Ho Chi Minh City on August, your guide has been a big help on my plan! Thank you once again. Anyway, how about the safety for woman during day and night time there? Specifically around Pham Ngu Lau backpackers area where I will stay. Your information is so much appreciated! Question for you.. I just went to this doctor here in the US about vaccinations before my trip. They were saying that I should get Japanese Encyephalitis vaccine which is like $300 for each shot (2 shots)! bring malaria pills, Hep B, Hep A, Tetanus, Rabies!, and blablabla list went on.. I’ve had Hep A/B already and tetnis already. I know you are not a doctor but since you live out there I thought I’d ask you what you think before I splurge on any of this. It can really add up and I think some of this is just unnecessary as I’m not really getting into any super jungle areas just staying on HCM Highway and Highway 1 for the most part. Yes, you’re right, I’m not a doctor 🙂 but I would say that it’s worth having all of the inoculations that you mentioned, however I don’t know about Japanese Encyephalitis – I don’t think I’ve ever had to have that one before, but I see that it’s mosquito-borne. When it comes to malaria pills, it’s up to you really. Many travellers start taking them, feel awful, and then stop because the side-affects of the pills are ruining their holidays. On the other hand, malaria is, of course, deadly. Seems the Japanese E. and Rabies are by far the most expensive. I know there are a lot of dogs there and maybe some bats but I can’t imagine getting attacked by one while biking. Stranger things have happened I suppose. 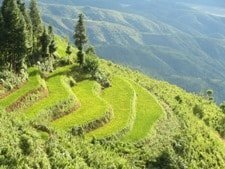 I am taking a 3 day Saigon 5 day Bali trip in Feb 17. I am looking forward to trying as many foods as possible, BUT..I have serious food sensitivities. I assume most foods are prepared from whole foods and grown herbs and spices and not processed or chemical laden as in the US? Can you offer any insight? Also, can you tell me how to translate MSG? Monosodium glutamate? I must be sure to hold a card that says please no MSG. 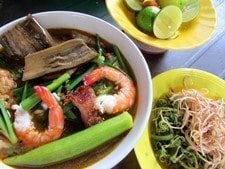 Yes, it’s very difficult to travel and throw yourself into a street food culture, such as Vietnam’s, if you are sensitive to those things. Many young Vietnamese also find themselves allergic to MSG these days. The word is bột ngọt. Put the word không in front of it to say ‘no MSG’. Almost everyone will understand this, but you should still be aware that most dishes which come in a sauce more often than not will have MSG in it. Yes, get a card printed with ‘no MSG’ on it. You’ll be OK if you stick to tourist restaurants but indulging in the street food scene may be a little trickier. However, I have had other readers in the past with similar sensitivities and they’ve managed fine and enjoyed the cuisine here. Thank you for your interesting in our country. Thanks for your advice. In my experience ‘bột ngọt’ is understood in both northern and southern Vietnam, but I suppose it depends who you meet. I bumped into you in the past, and a Vietnamese friend of mine brought up your name and referred to your post on the CAFE APARTMENTS on Nguyen Hue street. I laughed when I recognised who you were. We haven’t met for a while, BUT many things you mentioned about Vietnam is the same way I feel about the country. Even being from Australia originally, I get a sudden sense of PEACEFUL enthusiasm to walk around anywhere here. It’s something that people may not realize, when ONLY knowing about the country because of it’s difficult history of change and discovery to grow from those times. I feel more peaceful here than in Hip Rocking SYDNEY !!! It’s funny that many of the places you mentioned in HCMC, I’ve been to as well hahahahahaahaha, BUT I guess it’s not UNUSUAL because for those CURIOUS to discover HCMC, that a common place to find is the reason why people almost always by chance enjoy the same places. The friend of mine here that pointed out your article is the owner of MetSigns cafe in the CAFE APARTMENTS on Nguyen Hue street (now being popularly called pho di bo). That whole building 42 Nguyen Hue street, is CONSTANTLY CHANGING every MONTH. Vietnam is becoming progressively EXCITING !!! Now with FREE WIFI on the WHOLE STREET… that location will be MORE HIP than any place I know in SYDNEY !!! More INTERNET AVAILABILITY in FASCINATING HCMC !!! Viva VIETNAM !!! Hahahahahahahahaaha… BE COOL MAN !!! I’m happy to hear you’ve enjoyed reading some of my articles, and that you have also visited some of the places before. Yes, we must have similar tastes! I hope you continue to enjoy life here! I am impressed and fascinated by all the work you’ve done with all the videos and all the information about destinations and traveling around Viet Nam. I am married to a Vietnamese woman and spend half of the year in Vietnam, Saigon. We live in Saigon from October – April and in Norway when it is summer there. Would just like to thank you again for all the great information in your website and all the fine videos on youtube, – and then show my appreciation for the work you do. We have our honda and have been inspired to take the motorbike along the : « Ocean Road from Saigon to Phan Thiet / Nha Trang» , and to Dalat where I could like to live, ( instead og noisy and dusty Saigon). Could wish to contact you one day in October or November when we return to Saigon for a little chat, if possible ?? Thanks for your kind words about my site. I’m happy to hear you’ve enjoyed reading it. The ride along the Ocean Road from Saigon up to Nha Trang, and then the mountain road up to Dalat is great – I’m sure you’ll enjoy it. I travel around quite a lot so I never really know where I’ll be from one week to the next, but let me know when you’re here in the autumn. If we can’t meet there’s always email instead. My wife and I are planning a trip to Vietnam. I’m a retired U.S. Marine serving three tours during the war. The first one was with the ARVN as a infantry battalion advisor and the last tour was with the Vietnamese Marines as a senior Brigade advisor– all with infantry units. My question is how are folks like me treated now that the war has been over for many years. Will there be some resentment? I’m thinking about 2-days in Saigon, two or three days in Nha Trang, two nights in Hoi An/Danang and two nights in Hanoi. How is the best way to use your good services/advice. I’m thinking about planning this trip in January or February next year. I’m coinciding this trip for a stay over in Cebu, the Philippines and maybe three days in Hong Kong. What do you think?. In the vast majority of cases you will not be subject to any resentment. Vietnam has an extremely young population and many Vietnamese view the war as simply a subject at school, and even those that don’t are very unlikely to harbour any resentment or bad feelings towards Americans. In general, most Vietnamese – whether they fought in the war or not – do not hold grudges against individual Americans: they may resent US government policies during that period, but not the soldiers that fought on the government’s behalf. You may be offended or disagree with some of the interpretations of the war in Vietnam – such as, propaganda in museums etc. But, you’d be very unlucky to experience a verbal confrontation related to the war in Vietnam – unless, of course, you seek it. January and February are great months to be in the south of Vietnam, but in the north and central provinces it will be cold and grey. However, this is also the time of the Tet Lunar New Year celebrations so there’s always a lot of buzz across the country at that time. If you will be visiting during the Lunar New Year holidays it is highly advisable to book everything in advance – transport, tours, hotels etc – because things can get extremely busy then. You can read more about weather and where and when to go in my Weather Guide. I am vietnamese who is a non native english. I was so happy to find our a great website that I can learn more english in travel field. I can’t afford to pay for travel in this moment, but I will save your website like tips for the future. I also share it to some groups on facebook, there are many foreigners who want to explore vietnam. Thanks 🙂 It’s great to hear that you are enjoying my website and sharing it with others too. I hope you get the chance to travel and experience some of the places that I write about soon. I am Vietnamese and I also love travel. Today I am writing an email to my friend in Mexico and I found this website. I am very surprise and impressive about this website. Please let me know if I can help you for anything to contribute for your website. I am willing to do it. Thank you for your offer to help. I appreciate it. I’ve also really enjoyed reading your information. It’s great because it’s so detailed. I wondered if you could recommend a travel guide for an independent traveller? I’ve been to Vietnam 2X and want to do some research on Ho Chi Minh so want to go to Pac Bo and Dien Bien Phu from Hanoi. Do you mean a tour guide? If so, I don’t have much to offer you I’m afraid. You could try contacting Buffalo Tours and explaining exactly what it is you want/need from a guide and they might be able to tailor something/someone that suits you. Buffalo Tours are good – probably the best in Vietnam. If you mean a guide book, then a mixture of the big guides – Lonely Planet, Rough Guide etc – and online information – Rusty Compass, Travelfish etc – plus some background reading – there are lots of biographies of Ho Chi Minh available – should do the trick. I assume you’ve already taken a look at my guide to Pac Bo Cave – beautiful place and massively significant. Thank you so much for sharing your experience. I really enjoy reading your blog. It was our first time in Asia, and first time on a motorbike. We drove from Ho Chi Minh to Hanoi and loved the adventure! Thanks. Great to hear you enjoyed your Vietnam road trip. I hope you’ll be back in Asia again sometime soon. I live in the States and just came back from an unforgettable adventure in Vietnam. I remember looking through your website on my iPhone while I was in the south (Nha Trang) once I heard about the Ho Chi Minh Road. I could feel your passion for Vietnam’s unparalleled beauty through your site, and I’m so grateful for your guidance on which routes to take in order to maximize the beauty. Super long story put short, it changed my life. It’s an odd feeling being back in the States…it’s like I’m having withdrawal from some powerful drug. I’m wondering if something similar happened to you. I’d love to go back…I’m currently working on moving my teaching business to an online platform so I can make money while traveling. Anyway, thank you for being you. I hope you get the chance to come back to Vietnam are do some more inspiring journeys. I just want to thank you for putting together such an amazing website! I found yours through Jodi Ettenberg’s site and I am very touched by your apparent love for Vietnam. Make me so much prouder to be a Vietnamese. I’m heading to Saigon in a week to visit family and friends. Looking forward to try some of your food & drink recommendations. It’s been 4 years since I’ve been back, so I’m sure a lot has changed. 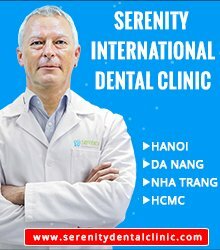 Cám ơn và chúc anh nhiều sức khỏe! I sent you some pictures through your facebook! Thanks, Patrick. I’ll take a look. Have you ever been to any spring water in DaLat or handicraft village or bamboo village? Actually , the pine road is the way heading to my hometown. I would like to send you some pictures and maybe you have been there. No, I don’t think I’ve been there. Sure, send me some pictures. I could not believe that you have been living in Vietnam and Have written such wonderful stories. T hank you for having good thinking about VN. As you hvae been written about beutiful places of VN I would like to guide you to the north of Dalat if you find interesting .It is the road heading to the North of central high land. 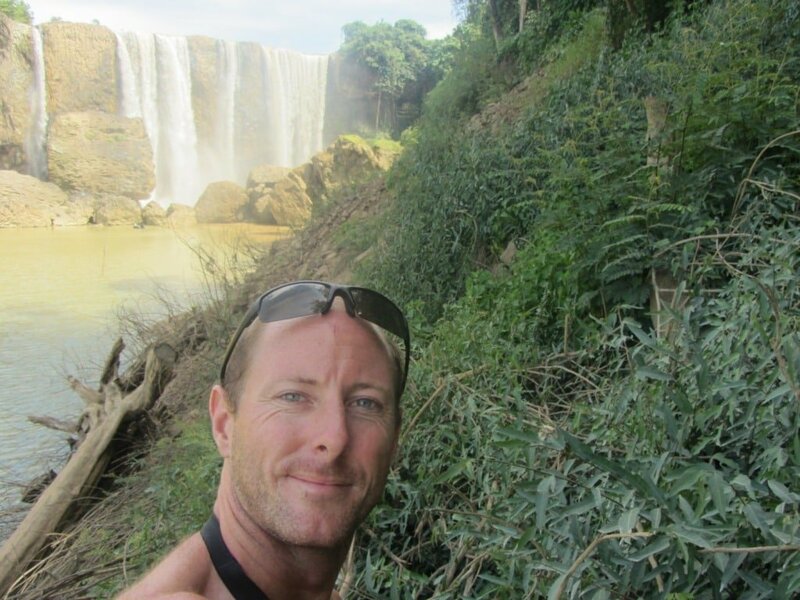 There are a lot of villages ,waterfall, coffe plantation,rice field…you can find some on my face book( shane kosa). I have taken some foreigner friends they all loved it..I f you are interested in..please feel free to text me on facebook. I hope you keep writing interesting thing about Vietnam! Thanks. Yes, I have been on some of the roads to the north of Dalat. I wrote about one of them recently: The Pine Tree Road. I also climbed Lang Bian many years ago 🙂 Which roads north of Dalat do you like to go on? Brilliant to come across your site. We are not quite at the really adventurous end of the scale travelling with 3 really small kids but loving some of your recommendations and great detail your share, we’ll be using some of your tips when we arrive in 10 days time! I hope you enjoy Vietnam when you get here. I’m Vietnamese, Saigonese. I needed to find some information for my foreign friends, so I found you. I just want to say thank you for your love with my country. Vietnam Coracle is a wonderful, inspired website. You are very kind and thoughtful when you’re replied all comments with clear, helpful details. Just wondering if you can tell me the type of work you do n Vietnam? are you s English teacher at the moment? as I did read in one of your previous reports you come across to do ESL course? If I decided to live in Vietnam long term I would look at teaching English the hard part is knowing if I would enjoy teaching as forking out $1600US to do a month long TESOL course and then not liking teaching is a risk, but if I don’t try I would never know. Last time I was in Vietnam I did enjoy teaching many Vietnamese people English in parks as most would approach me and I would teach 3 people all of a sudden there’s 5 then 10 minutes later 10 in front of me but obviously this is a lot different to teaching in a school! Yes, I first came to Vietnam to do a TEFL course. I liked the course and I liked teaching so I decided to stay in Vietnam teaching English. It gives you a chance to live, work and travel in Vietnam (and other countries), but of course it all depends on whether you enjoy the job or not. There’s not really any way of knowing unless you try it. There are lots of decent teaching positions available so there’s plenty to choose from. A TEFL course in Saigon is good fun anyway. Like others, thanks for this site. It’s always good to read up on places as much as you can before deciding to embark on a journey there and you provide great information. I have looked at many TEFL courses in Vietnam and confused as to the best option? Can you tell me which organisation you did your course with? Thanks. My TEFL course was with TEFL International. It was superb: the instructor, the course, the teaching practices and the other students – it was a perfect combination. However, we simply got lucky that all those aspects aligned themselves for our particular course – it doesn’t really have that much to do with the particular organization you choose. One thing to consider if you’re doing a TEFL in Vietnam is that, in Vietnam, when you first find a teaching job you will most likely be teaching children – regardless of your preference or skills. For me, this was perfect because my TEFL course had focused primarily on teaching children. But, for many people – especially those who’ve done a CELTA course, which focuses of teaching adults – this can be a big problem. So try to think about what age/ability you’d most like to teach and then see if you can find out which TEFL courses focus on which age bracket. AMAZING site. Thank you for all the effort you have put into it. The information is excellent and well written. I am coming to Vietnam in 2017 for an open ended trip. Now all I need to do is find a similar site for India! Any suggestions??? Correct me if I’m wrong but I noticed you haven’t ridden down Soc Trang, Ca Mau area is there any reason for this? as I was looking at going Ho Chi Minh – Can Tho – Soc Trang – Ca Mau – Rach Gia – Phu Quoc. Just wanted to know if there as any issues with riding in the Soc Trang / Ca Mau area? I shall correct you 🙂 I rode there a few months ago: this is my guide. I’ve also written a guide to driving across the Mekong Delta to Phu Quoc Island here. And a guide to Phu Quoc’s Beaches here. Just what I was looking for you! I’m planning a one month road trip with my brother in Vietnam in January and have been using your website a lot for reference, it’s incredibly helpful! I was wondering what HP or CC engine you would recommend? I’ve been mostly looking into 125CC/ 10HP, but am unsure if they’ll have enough power to take on some of the mountain passes in North and Central Vietnam. Let me know your thoughts! Yes, 125cc is absolutely fine for any of the roads I’ve written about on my site. The only reason you would need something more powerful is if you were planning to go off-road. Even with a passenger and luggage on the back a 115 or 125cc bike will be more than capable on getting up the steepest of hills in Vietnam, as long as they are paved roads. Obviously you should make sure that the bike is in good condition before you set off. I learned your website on google and very glad that you have made a very exciting street food in Saigon. Hope to read more about your articles. I am currently working for a school of culinary arts in Saigon. And I would like to hear from you. Thank you. Great site and have shared it with many people that I work with. I have a question for you please. Bike rental company in Denang that will allow for drop off in Hue? The idea is to do the Hai Van Pass. I emailed the bike company you mentioned but they do not have a partner in Hue to drop the bike off at. Did you try Rent a Bike Vietnam and Flamingo Travel already? They should both be able to arrange drop off/pick up in Hue. 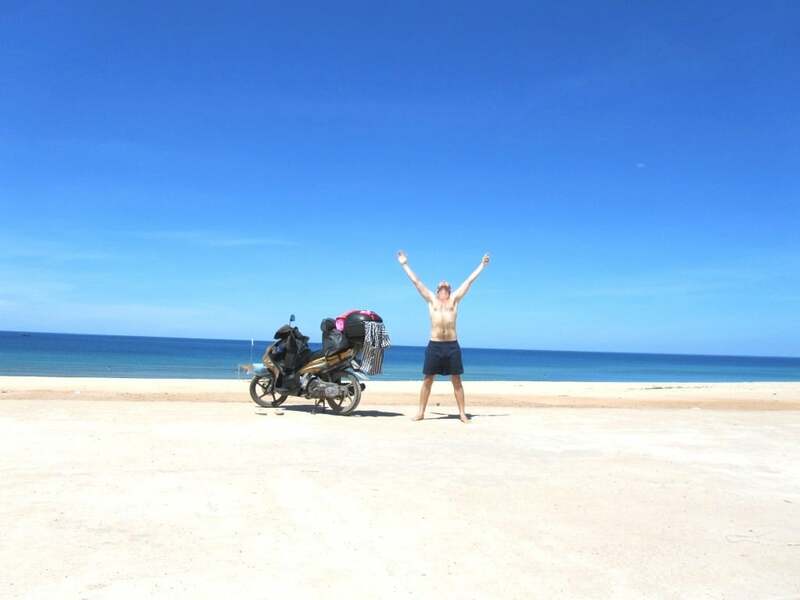 You might also try contacting Hoi An Motorbike Adventures to see what they can do. Great Blog! I’m going to travel from north to south on a motorbike, 20 days in September! Found great tips here! This is going to be very helpful! I have one question for you: rent or buy? Some people say that its a better deal buy a motorbike in Hanói and then sell it in Ho Chi Minh, for example, than rent it for 20 days. What do you think? Is that too risky? Yes, that’s a big question for many people. I think it’s all about time. Finding a good bike for sale and then checking it and making any additions (if needed) can takes days, and then finding a buyer at the other end can also take days. So if you have less than a month in country I do not think buying a bike is worth the time and effort. With 20 days I would rent a bike from a reputable company – try Rent a Bike Vietnam or Flamingo Travel (you can mention Vietnam Coracle if you like, they know me). Organize it in advance so that they will have the bike you want when you want it. Both of those companies can pick your bike up at the end of your trip. Other advantages of renting are that you can be more confident about the condition your bike is in, and if something goes wrong on the road – e.g mechanical or maybe you get stopped by the police – you can always call them for assistance. When it comes to money, again it’s all about time. If you’re only here for 20 days you won’t be saving much by buying instead of renting. A friend and I are planning a month long trip from Ha Noi to HCM city the month of December. So glad I found your site. We were going to buy Honda Wave and/or Win (2 bikes) until I noticed that you have a Nouvo. You write that you’re happy with your Nouvo. If you were to buy another bike today, would it still be the Nouvo or would you recommend another bike. We plan to buy used bikes in Ha Noi, and have them reconditioned for the trip south. Though we have looked up Craigslist, due to time constraints, we most likely will buy the bikes from a dealer in Ha Noi. Any recommendations you have on bikes and where to buy them would be much appreciated. BTW, we’ll be taking the HCM Road that you have recommended. Thank you again for taking the time to put on this site. Great information. Yes, I’m happy with my Nouvo, and if I was to buy another bike tomorrow, I’d buy a Nouvo again. Every single road trip guide that I’ve written on my website, I have ridden it on my Nouvo. They are reliable, very easy to drive, and can be repaired almost anywhere. However, the same can definitely be said for the Honda Wave. The Win is a bigger, ‘real’ motorbike. Ultimately, it depends on how you want to do your driving and what kind of roads you will be on. If you are going off-road you will certainly need a manual bike, and preferably a ‘real’ motorbike, like the Win. If you’re staying on paved roads, then the Nouvo or Wave is all you need. Some people prefer to Wave and Win because they are manual and you get more of a feel for the bike. But if you want it simple and comfortable, the Nouvo is fine. Craigslist will have bikes on there, also you could look for a Hanoi Expats Facebook group – I’m based in Saigon, and the expat Facebook page often has ads from people selling good bikes. You might also contact some of the reputable bike rental companies in Hanoi: I recommend Flamingo Travel and Rent a Bike Hanoi – they may be able to guide you in the right direction for purchasing a bike. Hi! I’ve been having a look at your website and you seem to have a vested personal interest in Vietnam which makes you stand out from the usual travel guide type website. My friend and I are going to Vietnam south to north from 1st June-17th August. I have some questions, do you know anything about getting a multi entry 90 day visa?? And if a multi entry visa is not possible, does Vietnam have the excitement and abundance of adventure to keep my friend and I entertained for 2 and a half months (im sure it does hehe). We’ve heard about these ‘on arrival’ visa’s you can get but they don’t sound too reliable and many websites claiming to issue 90 day multi entry visa’s appear questionable to say the least…You got any advice for me?! I’m not certain of the visa situation at the moment. There have been an awful lot of policy changes over the last few months – no one, including the government, seems to know what the actual situation is. However, I would advise against the visa on arrival. Lots of people do it, and it works out fine most of the time, but who needs the hassle of a long queue, paperwork, and uncertainty of not having a visa in-hand once you land. Better to prearrange your visa and slide out of the airport and straight into Vietnam, no fuss. Yes, there’s plenty to do in Vietnam for 90 days, especially if you have an adventurous spirit, palate, and a motorbike for at least some of that time. Well, 3 months is certainly plenty of time to enjoy riding in Vietnam! When looking for a Nouvo in HCMC to buy you can check the notice boards of popular budget hotels in the Pham Ngu Lao backpackers area. There’s always notices from people looking to sell bikes. Also, try Craigslist and other popular on-line listings. You can also contact some of the bigger motorbike rental companies in HCMC to see if they have any bikes to sell. Try Flamingo or Saigon Scooter Rental. Camping is fun and certainly doable, but it’s best to be as discreet as you can: try to find a place where you are not visible from the road. It also depends on the route you take. If you’re taking country back roads then they’ll be more opportunities to camp, but if you’re taking highways it’s unlikely you’ll find a suitable spot. Changing money in Vietnam’s bank is absolutely fine. Just be aware that anything other than US dollars, Euros, and Vietnamese Dong will be difficult to change anywhere. Also, Vietnamese banks (and other exchange outlets) are very fussy about the condition of notes – anything that looks old is unlikely to be accepted. This is a great website! I am loving reading about your motorcycle adventures, the information you provided is exactly what I am after and from someone who enjoys the travel on motorbike so much.which means now I don’t have to read the forum posts from haters saying don’t ride a bike in Vietnam blah blah blah but with riding sensibly and cautiously as you mention you should be fine. 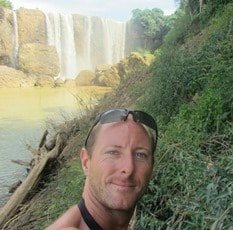 I appreciate the time you have taken to write all this comprehensive information, I am planning 3-6 months in Vietnam alot of the time on motorbike with the hope of living there permanently as I loved it so much last time I visited! If you’ve got 3-6 months in Vietnam and a motorbike you’re guaranteed to have a great time! I hope you get a lot of exploring done and really interact with Vietnam at every turn and in every way. Hi Tom. Love your blog and like everyone else am grateful for the time you spend on it and the detail you include to enhance the experience of Vietnam for all who read it. A couple of recommendations for other readers. Cong Cafe in Hanoi, opposite the Cathedral. Try the Vietnamese coffee with condensed milk and coconut. Hoi An. Did a tour called The Taste Of Hoi An. Well worth it. Neville and his wife Colleen are Australians who have lived in Vietnam for 5 years. Don’t let that put you off. They use locals as guides and the whole day is worth every cent you will spend. Neville will give you great recommendations on everything from where to eat, where to buy clothes and jewellery, where to buy leather etc etc. If you don’t do the tour you must go to Madam Kanh, the Banh Mi Queen. She truly is the Queen. Sit down to eat and ask her daughter to make you a coffee. You will not regret it. Dalat. A dessert place at 59 Duong 3 thang 2. We had the banana wrapped in sticky rice and banana leaf cooked over coals and served in a sago sauce. Really really good. I didn’t have a sweet tooth till I came to Vietnam! Now it’s off to Saigon to try some more of Tom’s recommendations.Cheers. Alison. Good to hear you’ve had a great trip in Vietnam. Thanks for the recommendations. I’m sure my readers will benefit from your tips. I hope you enjoy Saigon as much as the rest of the country. I want to say thanks, for being such a nice ambassador for VN tourism. Will be a close follower of your site! Tom, myself, daughter and son in law are coming to Vietnam in February. We are flying into Saigon renting bikes and riding to Hanoi. We have two weeks and are really looking forward to the trip. Your site is very interesting and I am sure it will be a big help. Do you know anything about Flamingo Travel where we might be renting the bikes? Sounds like a great trip in prospect. I’ve never had any direct contact with Flamingo, but I’ve meet plenty of people who have and they all seem to have had positive experiences. I usually rent bikes for friends and family from Rent a Bike Hanoi, they are easy to deal with and very efficient, as I’m sure Flamingo are too. Good luck with the trip. Probably best to stay in the south at that time of year. Try the the Nui Chua Coastal Road and the Southeast Loop – they can be easily combined for a great coastal-highlands ride. Hi Tom! I just stumbled upon your website and I love it. I’m a Viet Kieu and have been back many times. I still love to visit there, but like many tourists, the country and its rapid development often leave me very disappointed. However, the country is still incredibly beautiful and the food is amazing (and I’ve had lots of Vietnamese food everywhere). And once you really get to know the people, they are generous and sweet as ever. Reading your blog and seeing your perspective on VietNam have given me a new appreciation for my native land. Cam on rat nhieu! I’m glad you enjoy reading my blog and it’s good to hear your enthusiasm for Vietnam. You’re so right. I’ve been here in Saigon a little over a year, and feel that Vietnam reveals more to me every month. I’m in love with this country. You have an incredible website! I can’t wait to put much more of it to use – your project is an inspiration. Thanks for all the time you must put into this. I look forward to seeing even more of this great city and country with your guides. Thanks, Ben. I hope Vietnam continues to grow on you. Thanks for all the effort you put into the site, as a recent arrival to HCMC, you given me many great ideas for dining places to check out. I guess having lived in Vietnam so many years, you must’ve learned the language quite well. How important has that facility been to your experiences in the country, and can you recommend a good school in HCMC? Yes, I’ve been in Vietnam 8 years. I have learned a fair bit of the Vietnamese language, but I’m nowhere near fluent. If you make an effort with the language you will benefit hugely in every way. There’s a company called I Love Vietnamese Project (google it to find their website) – they offer free lessons from English students in Saigon. This might be a good place to start. I started with one-on-one lessons at a couple of universities in Saigon – Dai Hoc Su Pham and Dai Hoc Nhan Van va Xa Hoi. Classes used to be $10 an hour – no doubt it’s pricier now. Spending 25 days in Vietnam over the summer hols with my pregnant wife. She says she “won’t try street food as it’s more likely to be unhygienic”. Is this true? Also any tips on travelling with a pregnant lady? Thanks. Well, street food is certainly one of the main highlights of a visit to Vietnam and it’d be a shame to miss it. As for hygiene I rarely have any stomach problems, and whenever my friends or family from the UK come to visit me here I take them all to my favourite street food places – they dive right in, straight off the plane and off to a food vendor, and they seldom suffer any tummy trouble. In general, I’d say if you find a busy place it’ll be good food and clean and fresh. Anyway, who’s to say that restaurant food is cleaner? You can’t see what the condition of the kitchen is so you’ve no idea how clean (or not) your food is – at least with street food it’s all out in the open and there for everyone to see. I have no experience travelling with pregnant women, but Vietnamese adore children, and pregnant women are treated with great sensitivity, so I shouldn’t think it will be an issue. “You can’t see what the condition of the kitchen is so you’ve no idea how clean (or not) your food is – at least with street food it’s all out in the open and there for everyone to see”. Hi Tom excellent Blog, what is your country of origin ? I’m Vietnamese but currently studying abroad and only get to go home for 2 months every year during summer. I always want to spend those 2 months eating as much Vietnamese food as I can so I won’t miss it (but I will anyways) when coming back to Canada. I has been looking for good places to eat this summer in HCMC for the past few weeks. That’s how I found your website. And wooow, your website is impressive! You probably have tried way more food in Vietnam than I have 🙂 I enjoy reading your blog. Thank you, I’m glad you enjoy my blog. I hope you get a chance to eat lots of Vietnamese food when you get back to Vietnam next time. If you have any favourite places to eat let me know – I’d love to try them out. 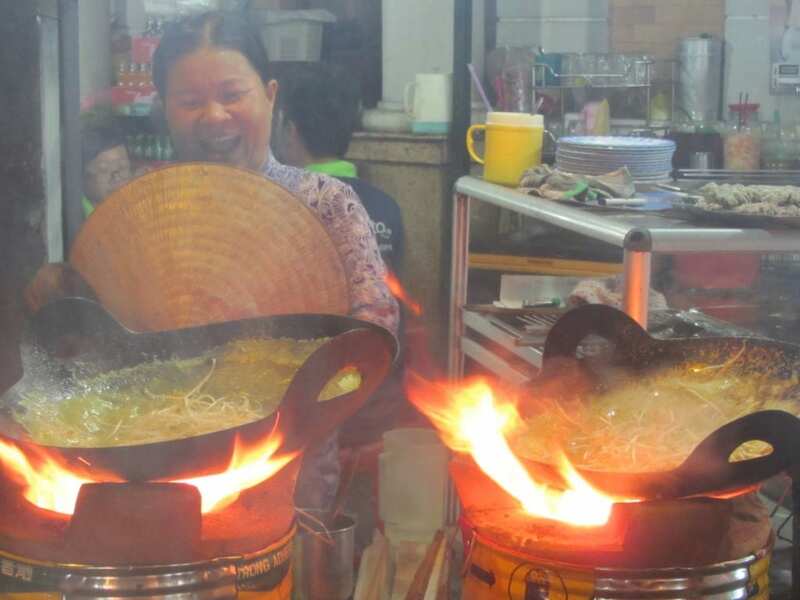 I think you’re right that many foreigners are a bit reluctant to try street food, but that’s changing now because of blogs and street food tours in Saigon and Hanoi that are getting more and more popular. Wow, I have to tell you, this is one of the BEST blog I’ve ever seen! Lots and lots of precious gems. hey jut wanted to say that your website is bloody great. been a real help on the coast. when looking for information on dai lanh beach and hon gom sand bar i found nothing until yours. bloody awesome lil website. keep up the good work. Hi Ryan, glad you found the information helpful. I love that area around Dai Lanh and Hon Gom – great beaches!